Steam cleaners are cheap and easy to use so why shouldn’t they be used on stone floors? Simply put, using super heated water can damage the surface, increase the risk of staining, cause corrosion of metallic elements within a stone surface and cause salts to surface. Steam penetrates into the cracks and fissures of a solid surface and weakens the stone. This eventually causes the surface to break up and causes visible damage. 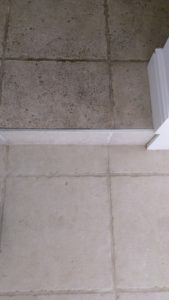 Stone surfaces are often treated with a sealer. Topical sealers sit on the surface and are designed to wear away and be replaced as necessary. Think of them as a sacrificial layer that protects the surface underneath. Applying heat and agitation removes the sealer faster than normal wear and tear. This leads to increased maintenance and a degradation in appearance. Impregnating sealers sit in the surface of the stone and they are usually fairly resistant to the heat and moisture. But if cracks and fissures are opened up in the surface the sealer is not present and can’t do its work. The exposed stone is more difficult to clean and increased the maintenance overhead. Instead of using steam I would recommend a liquid cleaning solution applied ‘hand hot’ with a mop and gently worked in with a soft brush or pad. The solution and soiling can be removed with a mop or wet vacuum and then rinsed with plain water. The solution can be alkaline for deep cleaning or neutral ph for maintenance cleans. For advice or a survey to see how a professional will clean and maintain your floor in Warwickshire you can contact me, Neil Worsnop, on 01926 492696 or neilworsnop@allsquarecleaning.co.uk.